Victorian illustration of the anthemion motif – lotus flower with palm leaf. I always have my camera with me to snap attractive colour combinations or interesting patterns. Architectural and sculptural details are a great source of diverse ornamentation such as the anthemion motif. The design is based on combining the lotus flower with palm leaves and has a long history of being reinterpreted and reworked over the centuries. The term ‘anthemion motif’ as a decorative expression appears to have sprung into use in the mid-nineteenth century with anthemion literally meaning ‘flower’ in Ancient Greek. Victorian drawing of Ancient Egyptian lotus flowers. The Victorians were great organisers and cataloguers not only did they classify the wonders of the natural world – beetles and finches spring to mind, but they also applied their energy to sort and order the history of the human-made world. On the 15th December 1856, Owen Jones published the now famous Victorian reference guide to decoration – ‘The Grammar of Ornament’. Victorian drawing of palmette detail from the Parthenon. 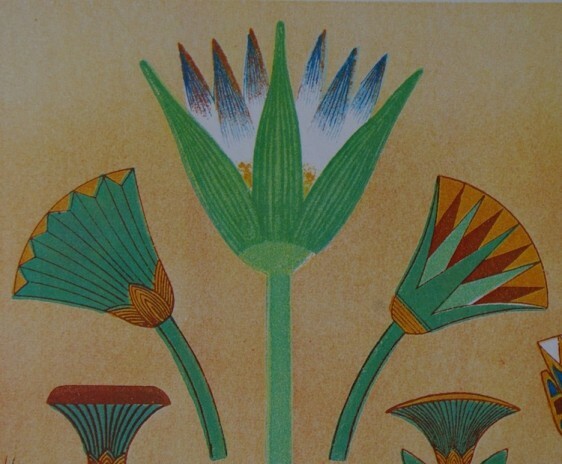 Illustration of lotus-palmette frieze Ancient Egyptian design. Illustration of capital detail showing palmette and lotus flowers. 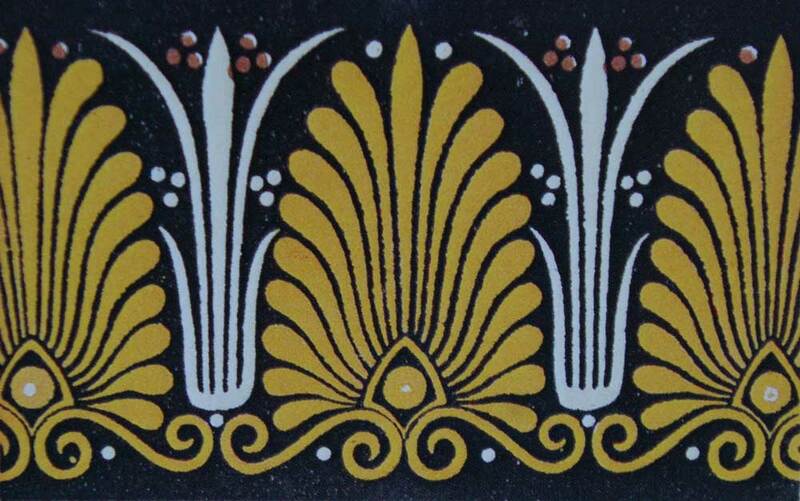 Victorian representation of Ancient Greek lotus-palmette design. Looking through this beautiful, illustrated book of decorative details it is possible to follow the migration of the lotus-palmette motif from Ancient Egypt, through time to the Ancient Greeks and across the ancient seas giving rise to this Etruscan version currently displayed in the British Museum. Etruscan carved stone showing the lotus-palmette design, the anthemion motif. Now, in the 21st century we take for granted the near immediate global transmission of ideas, image, text and music on the Internet, yet there is something pleasing in knowing that we are part of a continuum of the interaction and exchange of designs.